My veggie recipes for the UK based website, Hello Fresh. My very first published Hello Fresh UK veggie recipe! And it went off with a bang! BANG! This is one of my all time favorite recipes that I came across while on a shoot in Istanbul, Turkey. The food in Turkey is indescribable. It’s so full of flavor and surprises. Cold is mixed with hot, crunchy with smooth, salty with sweet (just to give you an idea), your mouth is very very happy! When we broke for lunch, the entire crew piled out into what was once a parking lot. Now it had been set up as our very own back yard BBQ. Huge white tents, coal BBQ’s, buckets of cold drinks and tables lined with colorful dishes. The dish that stood out the most, was this lovely simple, yet bursting with flavor, salad of eggplant (aubergine), potatoes, fresh parsley, garlicky yogurt and ripe tomatoes sprinkled with oregano. I never actually acquired the original recipe (my broken Turkish couldn’t quite figure that out…) so I had to put the recipe together through taste, vision and smell. This size will be large enough to feed 4 people. I suggest this size because this is truly delicious and I promise you will eat more than you think! I always clean the bowl. This dish is made in a few steps. First make the dressing. Basically you want to infuse the flavour of the garlic into the yogurt. So, crush the garlic as finely as you can, really get it smashed up. You don’t want to get any big chunks of raw garlic. Add this directly to the yogurt (use low-fat to help with the calories, the taste is the same) put it in the fridge while you continue with the rest. Next you are going to cook the above ingredients. On medium heat, add the olive oil and then the potatoes, you can chop the remainder of the ingredients while the potatoes are cooking as they take a little longer to cook. Next add the onions, then eggplant. Turn the heat down to a simmer and cover. Cook for about 20 min, or until the potatoes are cooked through. Finally, just before the final 2 minutes of cooking time, add in the garlic, you add this last so it doesn’t burn. Add the parsley, toss and remove from heat. Set aside. Chop the tomatoes and cucumber, add to a bowl and drizzle with olive oil, add the lemon juice, oregano and s&p. In a flat bottom dish layer the ingredients. First the cooked eggplant and potatoes, then drizzle the yogurt dressing on top and finally place the salad of cucumber and tomatoes on top. Sprinkle with some fresh parsley and serve! I like to keep it authentic by serving with Sesame seed Turkish bread, however if you can’t find that pita bread will work too. You can (and I do) eat this alone, however a nice side of couscous really makes it a hearty meal. Eggplant is a very good source of dietary fiber, potassium, manganese, copper and thiamine (vitamin B1). It is also a good source of vitamin B6, folate, magnesium and niacin. Eggplant also contains phytonutrients (which act as antioxidants within the body). Namely Nasunen. This is a potent antioxidant and has been proven to protect cell membranes from damage caused by free radicals. This is found in the skin of the eggplant, so don’t discard it! This is the greatest food product known to woman. Every woman should eat yogurt daily. The way yogurt is made (adding live bacterial cultures to milk or cream) is what makes it so healthy. These live cultures, are in fact GOOD bacteria. The kind the body needs in order to fight off the bad bacteria found in the body that causes bacterial infections and disease (ex. Yeast infections, UTI‘s). Healthy levels of good bacteria also promote healthy digestive and immune systems. Yogurt is also very high in Calcium. (necessary for strong bones and teeth) Yet due to the live cultures found in yogurt, it has a lower level of lactose making it the perfect choice for those people who are lactose intolerant. Yogurt also happens to be high in Protein (energy for the body). One thing to remember is that if you are ever prescribed a dose of antibiotics, you should always consume as much natural yogurt as you can. As the antibiotics will kill off the bad bacteria found in the body (what its supposed to do) but it will actually kill the good bacteria as well. Which is why many women suffer from yeast infections after taking a course of antibiotics. Yogurt will restore the good bacteria that is needed. 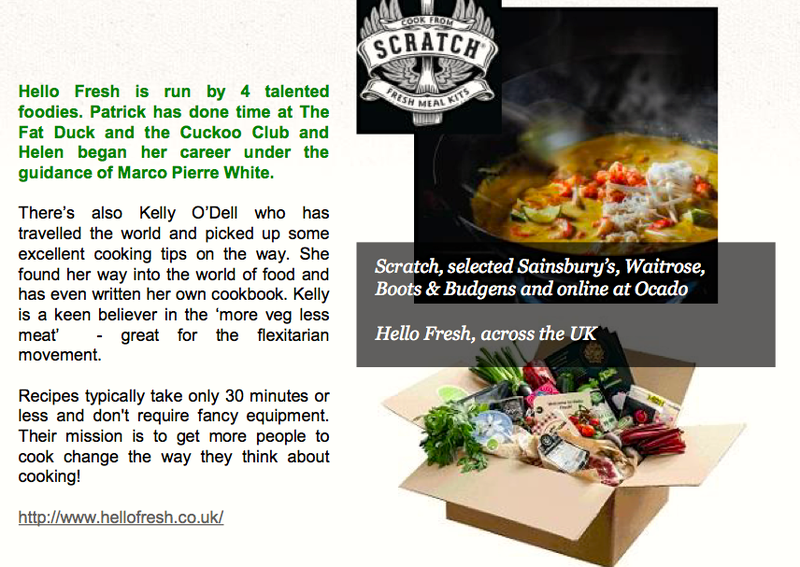 This entry was posted in BLOG, RECIPES, RECIPES FOR WWW.HELLOFRESH.CO.UK on November 28, 2012 by Kelly O'Dell.